(Tampa, Florida) – Baldwin Krystyn Sherman Partners (BKS-Partners) is honored to announce that after surveying more than 86,000 insurance employees, Great Place to Work® and Fortune have recognized BKS-Partners as one of the 10 Best Workplaces in Insurance. This ranking comes from an anonymous survey of insurance employees administered by the workplace culture experts at Great Place to Work®. BKS-Partners and the nine other winning companies were selected based on the evaluations of over 86,000 insurance employees who were surveyed using the Trust Index©, Great Place to Work’s employee assessment survey. 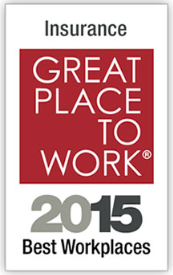 The 10 Best Workplaces in Insurance ranking is one of a series of rankings by Great Place to Work® and Fortune based entirely upon employee survey feedback from published Great Place to Work® Reviews.